The Kirkus Review calls the book, “A primer on the spiritual side of flags. A sincere, practical guide for adding flags to faith. Satan is real. He is supernatural. He is the enemy of every human being that walks this Earth. Satan’s goal is to seek, kill and destroy us, our peace, health, relationships, families, and hope. Satan wants to turn our lives into shambles. Most of all, Satan does not want us to be in a personal relationship with the one true God. This enemy is in a supernatural fight against us. God’s Holy Spirit is real. The book shows how you may invoke the presence of the Holy Spirit. It is the Holy Spirit’s power that causes this enemy to flee. The book teaches you how to prepare to use worship flags in this warfare. The book shows how to use flags in worship to God. 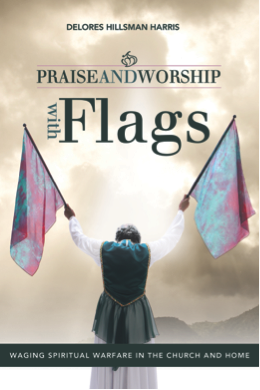 Delores Hillsman Harris shares insight given to her by God about the worship flags. One day while Delores was praising God with a streamer in one hand, the streamer “took off” under the control of the Holy Spirit.